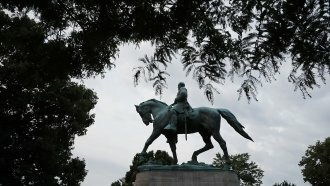 The statues were of Nathan Bedford Forrest, a Civil War general and early KKK leader, and of Jefferson Davis, the president of the Confederacy. Two statues of Confederate leaders were taken down in Memphis, Tennessee, on Wednesday night after months of planning and a little controversy. According to the Memphis Commercial Appeal, the statues have been "stored in an undisclosed location for security reasons." The statues were of Nathan Bedford Forrest, a Civil War general and early Ku Klux Klan leader, and of Jefferson Davis, the president of the Confederacy. Both statues were erected in the 20th century — Forrest in 1904 and Davis during the height of the civil rights movement in 1964. The mayor of Memphis supported removing the statues, but the city couldn't just take them down because of state law. The Tennessee Heritage Protection Act of 2016 governs the removal, relocation or renaming of memorials on public property, which prevented the city from moving forward without the approval of a state agency. So, the city council unanimously voted to sell the public park where the two statues were located to a nonprofit organization. The nonprofit then removed the statues. In a public statement, Memphis Mayor Jim Strickland said, "Though some of our city’s past is painful, we are all in charge of our city’s future. Black and white, young and old — every single one of us." The statues are no longer in the park, but many are expecting a lawsuit from supporters of the statues. And Tennessee House Republicans have called for an investigation into the removal of the statues.